Each year, Boyar Research publishes their Forgotten Forty Report featuring the forty stocks in their universe that they believe have the greatest potential for capital appreciation in the year ahead due to a catalyst they see on the horizon. Their 2017 report will be released towards the end of December, but in the meantime Boyar has been kind enough to provide our readers with last year’s report (which still contains many actionable ideas) for free. You can get your free report here. Some of the names featured include PayPal, Bank of America, Interval Leisure Group, Liberty Broadband, The Madison Square Garden Company, Harley-Davidson, MRC Global, Scotts Miracle-Gro, Sotheby’s plus 31 others. Every stock profiled in The Forgotten Forty has a one page write-up highlighting Boyar's investment thesis (including the company’s valuation and potential catalysts for value realization). 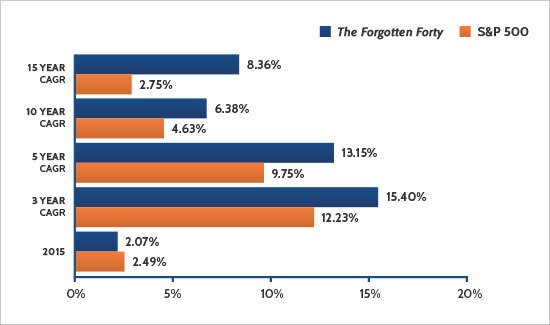 While the Forgotten Forty contains one page reports on each stock, readers should be comforted to know that Boyar Research has previously published a full-blown research report on every company featured. *Past performance is no guarantee of future results. These results are not audited.